July 11, 2015 - MAN WITH A MOVIE CAMERA, new restoration! The US Premiere of the new restoration of MAN WITH A MOVIE CAMERA, will screen at the AFI Silver Theatre in Silver Spring MD, with Alloy performing live. This is the same score we wrote in 1995 (and have performed extensively all over the world) but we’ll be performing to a new digital restoration of the film. The source print was a perfect nitrate print, left by Dziga Vertov himself in Amsterdam in the 20’s. Crystal clear, minimum scratches, excellent contrast and full frame (for the first time in my lifetime). This print is so much better than previous versions that it’s like watching the film for the first time. Alloy will be touring with the new restoration this fall, and probably for the rest of our lives! Look for us in the upcoming months in New Haven, Columbus, Lincoln, Omaha, Lawrence, Kansas City, Memphis, Nashville, Pittsburgh and beyond. The credits on this restoration are an amazing collection of the best archives, collectors, and distributors in the world: Lobster Films, Blackhawk Films, The Eye, Cinémathèque de Toulouse, the Centre National de la Cinématographie and Flicker Alley. Thanks to all for the opportunity to work with this amazing print of our favorite film of all time. April 17, 2015. Son of the Sheik DVD release at Roger Ebert's Film Festival. After much struggle, it’s finally here! SON OF THE SHEIK – the DVD. Newly recorded complete score by Alloy Orchestra. We’ll debut the DVD at the Roger Ebert Film Festival. Alloy premiered their new score for Rudolph Valentino’s signature work – SON OF THE SHEIK, at San Francisco Silent Film Festival’s special event. At the Castro Theatre of course. 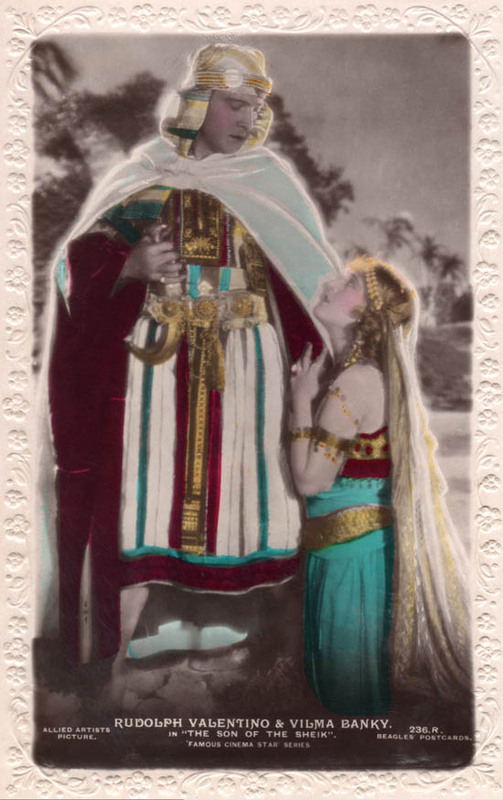 The show was also the premiere screening of the newly restored digital print of SON OF THE SHEIK. Restoration was completed by Box 5, Ken Winokur and Jane Gillooly’s distribution company. Previous releases by Box 5, with Alloy scores, have been: PHANTOM OF THE OPERA, and THE EAGLE. In SON OF THE SHEIK, Valentino plays an unusual dual roll, both the Sheik and his son. Vilma Banky costars. SON OF THE SHEIK was Valentino’s last film. The star died of a sudden infection two weeks before the general release of the film, while he was on a nationwide promotion tour. The film was a huge hit with audiences (grossing a million dollars in the first year) and critics have deemed it the greatest work of the actor’s career. Valentino’s death, coupled with the film release, became one of the greatest media events of the era, with 100,000 people lining the funeral procession in New York City. A riot broke out at the funeral home. There were even reports of female fans so despondent that they committed suicide. Alloy will tour with the film throughout the next year (and beyond).